The 36th Energy and Environment Exhibition (ENEX) organized by the Energy Conservation Center of Japan (ECCJ) recently came to a close. Held in Tokyo, Japan from Feb 1 to 3, 2012, the exhibition included exhibitors from over 75 different companies and organizations. The total number of visitors exceeded 12,000, with people coming from all over Japan and abroad. 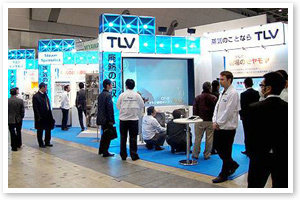 This year’s exhibition was a great success, and TLV would like to thank everyone that stopped by the TLV booth. TLV representatives were kept busy throughout all three days as the exhibition provided the ideal opportunity to mingle with customers while discussing solutions to common steam and condensate related problems. The importance of using high quality steam, recovering heat waste, and eliminating vapor clouds were some of the themes covered. TLV’s presentation entitled “Methods of Heat Recovery” also elicited much interest. The presentation was given as part of a series of talks covering modern methods of reducing energy consumption and renewable energy.